¶ 3 Leave a comment on paragraph 3 0 Only a Pawn is another Dylan protest song, and a very good one. On the most literal level the song is about the murder of Medgar Evers, a civil rights activist in the sixties. Evers was a field secretary for the National Association for the Advancement of Colored People (NAACP), a well-known organization that lobbies for Afro-American civil rights. Evers was a well-known figure in the early days of the civil rights movement. He played a central role in many voter registration rallies, economic boycotts, and sit-in demonstrations. Evers widow said her husband was resigned to the fact that he would be killed as a result of his efforts, asking her to take good care of their children after he was gone. ¶ 4 Leave a comment on paragraph 4 0 He was working in Jackson, Mississippi when he was shot in the back as he walked from his car to his home by a white supremacist named Byron de La Beckwith. The murder was a major incident, discussed in all the major newspapers, and was the subject of a cover story of the very popular Life Magazine. ¶ 5 Leave a comment on paragraph 5 0 Beckwith was tried three times for the murder. The first two trials, both with all white juries, resulted in hung juries. The third time he was convicted, thirty-one years after the murder. ¶ 6 Leave a comment on paragraph 6 0 Beckwith was a real piece of work. 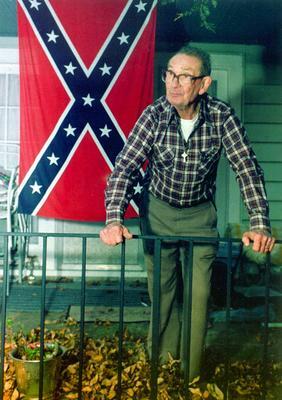 His nephew, Reed Massengill, wrote a biography of Beckwith, Portrait of a Racist. It’s an incredible portrait of a repulsive man and the equally repulsive organization he supported. ¶ 7 Leave a comment on paragraph 7 0 Not satisfied with being a card carrying member of the Klu Klux Klan, Beckwith was a member of the even more radical White Knights. (http://www.orderofwhiteknights.org.) He was a believer of what was called the Christian Identity, which teaches that whites are God’s chosen people and all other races are inferior. He was also a good friend of Richard Hoskins, the leader of the Phineas Priesthood, a guerrilla organization that supports the murder of interracial couples, Jews, and homosexuals, among others. The Phineas justify these beliefs by citing a passage in the Book of Numbers in which an Israelite named Phineas kills a kinsman who has had sexual relations with a non-Israelite woman. Oh brother. ¶ 8 Leave a comment on paragraph 8 0 Willie Morris wrote an interesting book, The Ghosts of Medgar Evers: A Tale of Race, Murder, Mississippi, and Hollywood, that is in part an Evers biography but mostly a behind-the-scene record of the making of the movie about the murder, entitled Ghosts of Mississippi. Morris portrays Evers as an extraordinarily hard working family-man who dedicated his life to the pursuit of equal rights. ¶ 9 Leave a comment on paragraph 9 0 Ghosts of Mississippi was directed by Rob Reiner. The movie centers on Alex Baldwin’s character, Bobby DeLaughter, an Assistant District Attorney in Hinds County who successfully led the effort to convict Beckwith. ¶ 10 Leave a comment on paragraph 10 0 DeLaughter wrote a book, Never Too Late: A Prosecutor’s Story of Justice in the Medgar Evers Case, which details his involvement in the ordeal. In the book he describes the enormous difficulties that he and Ever’s widow (and many, many others) overcame to win the conviction. DeLaughter’s marriage ended and the lives of his children were threatened. Many witnesses were run out of the state and others had their lives turned upside down. ¶ 11 Leave a comment on paragraph 11 0 Dylan has returned to the theme of racial strife many times in his career. The Ballad of Emmitt Till describes the murder of a young black man for the crime of whistling at a white man’s wife. He wrote George Jackson about the plight of a black man imprison under questionable circumstances. He wrote Hurricane about boxer Rubin “Hurricane” Carter‘s (arguably) unjust murder conviction. ¶ 12 Leave a comment on paragraph 12 0 It’s interesting to contrast Dylan’s song with Phil Och’s Ballad of Medgar Ever and Neil Young’s Southern Man. Ochs’ song generally pins the blame for racial hatred on the individual who pulled the trigger. Young’s song points at southern society. Dylan instead points not at the individual or a particular part of society but at the powerful middle and upper class individuals who use racial hatred to serve their own purposes: the sheriffs, politicians, governors, marshals, and cops who use poor white people to do their bidding, to help keep blacks and other minorities in their place. “The poor white man’s used in the hands of them all like a tool,” Dylan writes. ¶ 13 Leave a comment on paragraph 13 0 The idea that racial hatred was deliberately created and used as a tool by the southern establishment power brokers is not an idea that originated with Dylan. Mark Landis on rec.music.dylan pointed out that C. Vann Woodward argued this thesis in his excellent book The Strange Career of Jim Crow. Woodward provides a broad summary of race relations in the US from the civil war on. He also points out what he believes were the most important factors that caused changes in race relations during this time period. ¶ 14 Leave a comment on paragraph 14 0 Before reading Woodward’s book I had always assumed that segregation started right after the Civil War. This is not completely true. 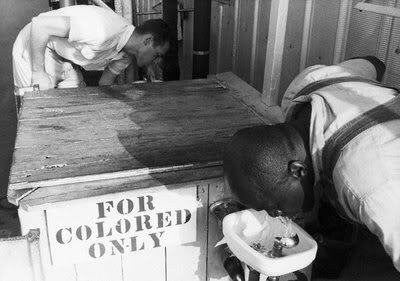 Although segregation and racial hatred certainly existed, in some areas of the South just after the war whites and blacks intermingled to a surprising degree. They could ride on the same railroad cars, attend the same sporting events, and some even went to the same schools. Many blacks voted, and their support was actively courted by white politicians. Black men were even elected to Congress. ¶ 15 Leave a comment on paragraph 15 0 Woodward argues that the passage of Jim Crow laws was not simply the result of the racial hatred, but rather a result of a concerted effort by the leading party at the time that was trying desperately to keep itself in power. Ironically, the Conservative Party had been a staunch alley of the blacks after the Civil War. However, their influence had waned after many instances of corruption within the party became known. To make matters worse, a devastating economic downturn gripped the South. In a last ditch effort to stay in power, the Conservatives attempted to gain the support of poor whites by painting the black as the source of their problems. Unfortunately, this strategy was successful. The Conservative Party played a large role in the passing of the Jim Crow laws which, among other things, legalized segregation and prevented blacks from voting. ¶ 16 Leave a comment on paragraph 16 0 Dylan also performed the song at the 1963 March on Washington (second song) . ¶ 22 Leave a comment on paragraph 22 0 A bullet from the back of a bush took Medgar Evers’ blood. A finger fired the trigger to his name. “You got more than the blacks, don’t complain. You’re better than them, you been born with white skin,” they explain. But the poor white man’s used in the hands of them all like a tool. And the hoof beats pound in his brain. 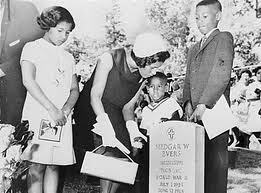 ¶ 26 Leave a comment on paragraph 26 0 Today, Medgar Evers was buried from the bullet he caught. They lowered him down as a king. This link, the duet with Joan Baez, leads you to ‘With God On Our Side’. Hey, Thanx for writing this article! Very insightful! I personally needed this because i have been singing the song for some time now but had a vague idea about its history, and felt like i couldn’t keep it going on for much longer, i wanted the entire truth behind it so that i could play it with more realness! I must say that its ironic that both of these men are WW2 vets, that they actually at one point in their lives fought for the same cause! Its also ironic that while Byron fought to end nazism, he was one himself, albeit in his country and under another flag and name! Human nature is so damn complicated, so much suffering has gone on and continues to go on, but when you have people like Dylan who can capture all of these things and put them into one song, that song becomes a picture of history, one that is carried in the hearts and minds of the people, so that hopefully the suffering will never be repeated again! Hi Joey, thanks for taking the time to write such an insightful comment. I appreciate it. That’s an interesting point that both men fought for the same cause. I hadn’t thought of it that way. Sad and weird. And, yes, “Only a Pawn” is a work of genius, for sure. I’m glad you found the article useful; it was fun putting it together. There was so much history that went into that one short song. Medgar Evers, far left, was threatened and eventually killed for registering African Americans voters in Missississippi. It was raining the morning of May 17, 2003. I was in my office, worrying about what the Jubilee! JAM organizers must be going through. It’s hard to make this festival pay off in good weather, not to mention in times of thunderstorms and crime hysteria. I knew the rain, coming on the JAM’s big day—Cassandra Wilson, Bob Dylan and Gerald Levert were scheduled that evening—would be playing hell with the moods of the organizers. Gulp. I had no clout that could help Mr. Evers meet Mr. Dylan. I also knew how media-paranoid Dylan is, and that his people had told JAM honcho Malcolm White that he would meet absolutely no one at the JAM so don’t bother to ask. I shocked myself by saying, “Sure, Mr. Evers, I’ll see what I can do. I bet Dylan would love to meet you.” I hung up, promising to call his cell phone with updates. Throughout the day, as the weather improved and worsened again, my quest didn’t go so well. Malcolm—who understood the gravity of the request—promised to ask Dylan’s manager, but reiterated the singer’s demand not to meet anyone. At 6:30, a half hour before the Dylan show, I checked in again, and Malcolm told me the prospect was bleak. Dylan’s manager said he might pass by Mr. Evers and shake his hand if he happened to be standing right there. No media, though. I said this wasn’t about me; I’d stay a mile away if I had to; this was about Mr. Evers and Mr. Dylan. The show was excellent, although truth be known the sound was better down in the mud where we watched the encore. I was a little disappointed, although not surprised, that Dylan didn’t seize the opportunity to sing “Only a Pawn in their Game.” Looking out at the mostly white crowd, gathered on the AmSouth lawn near where the old segregated Woolworth got its 15 minutes of fame in the 1960s, I told Mr. Evers, “I wish people like Mr. Dylan could understand the progress we’re making around here these days.” Mr. Evers nodded his head. We both knew that Jackson could handle hearing that song if Dylan could handle doing it for us. I went back and told Mr. Evers. He shrugged, saying that he’d enjoyed the show anyhow. I asked him to come back to our tent afterward to have his picture taken. He graciously said OK.
Mr. Evers was holding court at the tent, looking like he was running for office again as he waved and shook hands, when Holly appeared in the crowd. “Come. Now.” she commanded, breathless from running. I pulled Mr. Evers away from a conversation mid-sentence, and she grabbed his other arm. “Mr. Evers, I’m sorry to do this to you, but we’ve got to hurry,” she said, yanking him through the crowd, me attached to his other arm. When they let us through the fence, the scene suddenly became quiet and reverent with everyone seemingly scared to blink. I stopped next to Malcolm and Holly. Then Bob Dylan appeared wearing his white cowboy hat. He warmly grasped Mr. Evers’ hand and held it for a good five minutes while they talked eye-to-eye, heart-to-heart, man-to-man. They both nodded a lot and seemed emotional. I didn’t try to get closer. This was between two giants of the Civil Rights Movement, and the man they—we—had lost to hatred. I blinked back tears. Suddenly, Mr. Evers turned around and took my arm, pulling me forward. Mr. Dylan slowly turned his gaze to my face and reached for my hand. I shook it, just looking into his eyes, as Mr. Evers told him who I was, that I had a newspaper and that we’re trying to bridge racial gaps and do good things in Jackson. My heart was in my toes. “I’m honored to meet you” is all I said. Then Mr. Evers and I turned and walked away, with him hugging me with boyish delight. He thanked me profusely. I’m the one who is thankful. To Malcolm and Holly and Dylan’s people. And to Mr. Evers for letting me be part of his—and, by extension, Medgar’s—special moment. Another good reason to call Jackson home. Photograph cortesy of Mississippi Department of Archives and History. posted on Edlis Cafe on Facebook, linked here for safe-keeping. Eulogy for Medgar Evers.